EPW019018 ENGLAND (1927). White City, Shepherd's Bush, 1927. This image has been produced from a damaged print. Title [EPW019018] White City, Shepherd's Bush, 1927. This image has been produced from a damaged print. The derelict remains of the enormous Mountain Roller Coaster that was one of the many attractions of the various exhibitions held at the White City exhibition grounds. Greyhound track newly installed, the first meeting had taken place on 20 June. The 1908 Olympic stadium has just been acquired by the Greyhound Racing Association after years of disuse. 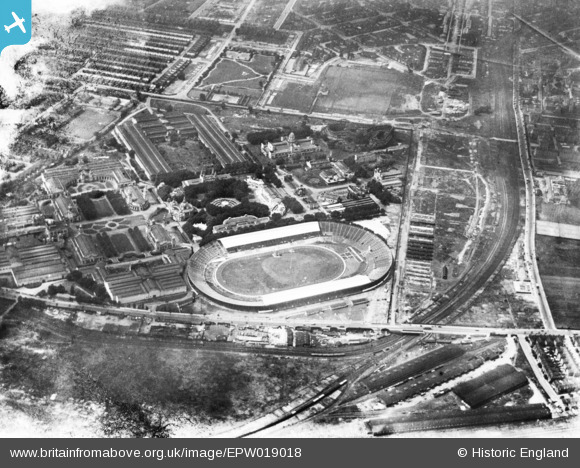 The greyhound track is in place, noticeably smaller than the one-third-mile running track which formerly lay inside the banked cycle track still evident in this view, but there is no sign of the Olympic swimming pool which once occupied part of the infield. The GRA will shortly extend the roof to provide continuous cover all round.